The demarcation between the defensive phase and the beginnings of the counteroffensive proved blurred at the time. Despite the American victory at Midway, the enemy seemed dangerous, aggressive, and capable of resuming the offensive. To forestall the threat to the sea lanes between Hawaii and Australia, the 4th Defense Battalion in July 1942 provided a detachment to protect Espiritu Santo. However, the invasion of the southern Solomon Islands and its immediate consequences clearly reversed the tide of war in the Pacific. 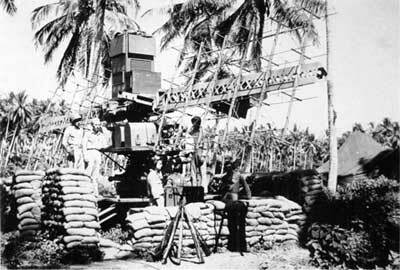 On 7 August 1942, the 3d Defense Battalion, commanded by Colonel Robert H. Pepper, who had been so instrumental in creating this kind of unit, landed in support of the 1st Marine Division's attack on Guadalcanal and the subsequent defense of the island against Japanese counterthrusts. The machine gun and antiaircraft groups landed "almost with the first waves at Guadalcanal, although the seacoast artillery did not arrive until late August. Once the coastal defense guns were ashore, they scored hits on three enemy ships that had beached themselves to land troops. In general, the 3d Defense Battalion lent strength to the defenses of Lunga Point, Henderson Field  named for Major Lofton R. Henderson, a Marine aviator killed in the Battle of Midway  and the naval base established on the nearby island of Tulagi. 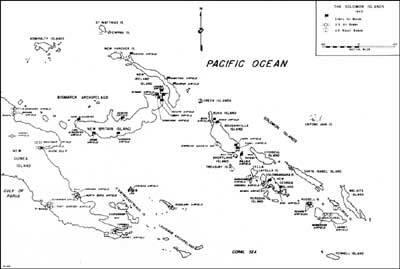 In early September, the 5th Defense Battalion, led by Lieutenant Colonel William F. Parks, supplied a detachment that took over at Tulagi. A combat correspondent with the 1st Marine Division, Technical Sergeant George McMillan, described the initial lodgment on Guadalcanal as a "stretch of beach, acres of straight-lined coconut grove, the fields of head-high kunai grass, and jungle-covered foothills." Six months of violent counterattacks by Japanese air, ground, and naval forces shattered the appearance of calm. Throughout the fighting "malaria, jungle rot, and malnutrition" plagued the Americans, according to Second Lieutenant Cyril P. Zurlinden, Jr., of the 2d Marine Division, which replaced the 1st Marine Division in January 1943, after the 1st had left the previous December. Elements of the 5th Defense Battalion not needed at Tulagi occupied Funafuti in the Ellice Islands on 2 October 1942. 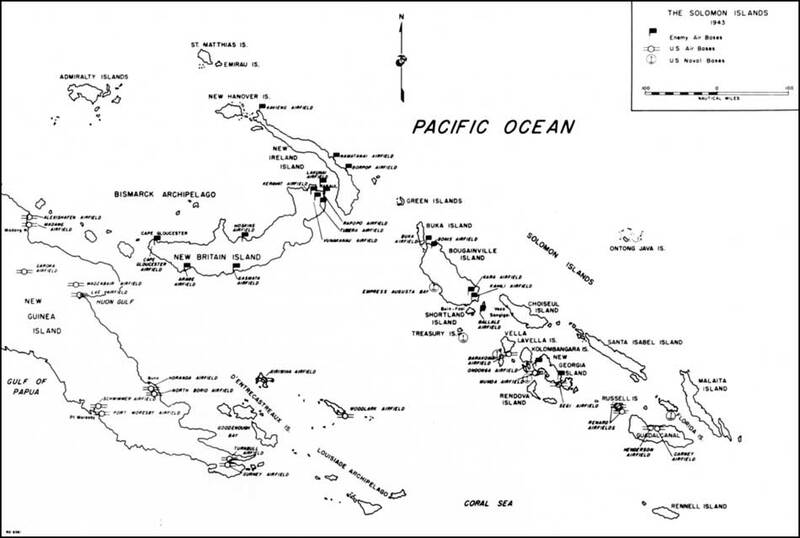 The Ellice force set up its weapons hundreds of miles from the nearest major American base and for the next 11 months held the northernmost position in the South Pacific, just short of the boundary between that area and the Central Pacific. The battalion's commanding officer, Colonel George F. Good, Jr., recalled that his ragtag antiaircraft and ground defenses "stuck out like a sore thumb." The Ellice Islands served as a staging area for raids on the Japanese-held Gilbert Islands and consequently bore the brunt of some 10 Japanese air attacks, during which the 90mm antiaircraft guns downed at least six bombers. Meanwhile, elements of the 5th Defense Battalion on Tulagi combined in January 1943 with a 5-inch battery from the 3d to become the 14th Defense Battalion. The 9th Defense Battalion, under Colonel David R. Nimmer, reached Guadalcanal in December 1942, set up its weapons around the airfield complex at Koli Point, and promptly destroyed a dozen enemy aircraft. Francis E. Chadwick, a member of the artillery group, recalled that the unit "met only stragglers upon landing and found an undersize, beaten enemy battalion." The Marine defense battalion thereupon began reequipping in preparation for the next move up the Solomons chain. In January 1943, the 11th Defense Battalion, commanded by Colonel Charles N. Muldrow, relieved the 9th Battalion of its responsibilities at Guadalcanal.